We open with “Climber,” a chilling work by Maggie Whitefeather. Dulce et decorum est pro patria mori? Next, Jonpaul Taylor, in his brilliant short work “The Sun Sets Largest on the Last Day,” reminds us of the gift given us beyond our mortality, if we will but believe. Beth J. Whiting then brings us her Fabulist work “A Hole in the Heart,” the quirky and sweet story of love lost and gained, and everything that happens in between the two. I then bring you one of my own pieces penned last Spring, titled “The More Things Change…” You’ll get all of the references, I’m sure, and I hope you enjoy the story. Then, we conclude with a little heathen god worship, courtesy of Lord Dunsany. It was March, a sunny, too-cold early Spring morning with snow still laying in shadowy crevices and the rock itself shimmering from the frost. Jim and Jess climbed an offshoot trail behind a row of granite cliffs at Sheboygan State Park, scrabbled over yards of large and small displaced boulders, then unloaded their rope and packs at the top. It may have been Jack and Jill who went up the hill, but it was Jim and Jessica who rappelled back down. After all, rappelling down hills was so much more contemporary than tumbling down hills, and Jim with his Dodge Ram pickup and Jessica with her Abercrombie jeans and black stilettos (though she never wore them climbing) portrayed the pinnacle of small town Iowan contemporariness. Jim looped the static line around the nearest tree, a cottonwood, then descended and belayed for Jess. Jess was new to this, but a quick study. She fastened her D-ring to the harness then held the rope in front and behind, like Jim had taught her. Nearing the edge, she eased her way over, backwards, and began her walk down the nearly sheer rock face. Jim went next. “Not bad for a first timer,” Jim said when it was all over. The gap between Jim’s front teeth blacked next to his bright whites. Jess got busy untying and redoing her laces. Her next pair of hikers would be of better quality. The laces on these kept slipping, but then what did she expect with a pair of $39 discount boots? She should have known better. Once she finished, she re-gloved, found a secluded spot, and dropped her jeans to her ankles and did her business. Yep, it was definitely cold. She wouldn’t wear these jeans again for climbing either. They were too loose and kept sliding down. But it had started as “one of those days” and it continued to be “one of those days.” At least Jim was his usual amiable self, and that helped. Earlier that morning, her cat, Pria, had dumped her milk dish when Jess walked by and of course per Murphy’s Law, Jess stepped in it. She was about to scramble to find another clean sock to replace the milky one when Jim called and said he’d be there in five minutes. If that wasn’t enough, the dishwasher overflowed just as the doorbell rang. She cranked off the valve under the sink and threw a towel down on the puddle on her way to answer the door. It was the mailman. He had a package for her, but it was too large to carry and she’d have to pick it up at the post office. She hadn’t ordered anything recently, but told him she’d stop by the next day to get it. He gave her the receipt and left. When she started back toward the kitchen, she sighed at the milky trail she’d laid on the carpet in her haste to answer the door. With Jim pulling up in the driveway and no time to spare, she slipped her new hiking boots on over her milky sock, grabbed her coat, hat, gloves, and belt pack, and promptly forgot her wallet. She and Jim always went Dutch, so she was a little embarrassed when they stopped for a breakfast bagel and Jim had to pay. Jess would keep up her end of the friendship by paying her own way. Next time, she’d buy. Jess walked the twenty feet or so to the trail head, and started up the path covered in pine needles and oak leaves. Ahead lay even larger rocks and a few bonafide boulders. Jess squeezed between those and the cliff. A baseball-sized rock rolled down to her left, bounced off a few others and disappeared. It was too large to just disappear. It didn’t clunk or roll farther down the hill; it dropped into something, a grassy spot, maybe, but she would have seen it. Curiosity possessed her. She grabbed the branch of a tree on the edge of the trail and slipped and slid until her feet landed on solid ground again. A little farther on she spotted a dark hollow, a small cave set into the hillside. Jim wouldn’t miss her for those extra few minutes. If anything, he’d think her privy time had been extended. Jess followed the terrain to the hollow, and leaves crunched under her feet—beautiful orange and red maples and brown oaks, the once-shimmery aspens and flat-as-paper balsam fir needles. She scuffed a long line in the dirt and parted them. She’d been lost in the woods once, and had to follow a friend’s voice to find her way back out. After that incident, she always carried the necessary items with her when hiking: compass, waterproof matches, pocketknife, and even a flare and a light stick—all in the pouch around her waist. She broke a small tree branch to mark her passage, then another one further ahead. Just in case. A few steps more and she reached the hollow. The opening was small but she scrunched down and squeezed through. So this was where the rock ended up. Jess reached for her waist pack, for a light stick, but drew her hand away. The walls flickered with luminescent particles of light. She pulled a knife from her pack and scraped at the wall; the light faded and then extinguished in that spot, and a few sparkly bits remained on the blade. She tried another spot. Same thing. Her eyes adjusted and the cave’s enormity spread before her. The main chamber split off at the back into two tunnels. Jess’ skin crawled. Imagine. A giant hole beneath the cliffs, and she didn’t even suspect it. Jess minced her steps on the slippery surface. She crossed the main chamber and veered toward the left tunnel. The shaft was long and winding with no further branches in sight. After several hundred feet of a gently sloping and seemingly endless downward trek, she rounded a bend and bright patches of green and blue filled the cavescape. It was like those jungle movies she used to watch as a kid when the blue sky would find little places to slip through the tangle of trees and vines, trees that reached up far beyond the trees of Iowa. Monkeys swung from tree to tree with their hand-toed feet, and their pink soles flashed in the heavily humid air. Several large blue and yellow and red birds flew overhead—something like parrots. A sloth hung from a branch and a hyena cackled in the distance. A deer drank from a stream to the right. Jess rubbed her eyes and blinked. Yes, she was in a cave. In Iowa. She would drag Jim here no matter how much he objected. And the camera—she’d bring the camera. It was time to start back; Jim would be frantic. But Jess glanced over her shoulder no less than three times before she reached the bend in the tunnel. They were still there, the trees, the monkeys, the parrots. Her mind worketh aright; she wasn’t hallucinating. At the junction of the two tunnels, Jess took a step toward the large main room and the cave’s mouth, then turned to the right tunnel instead. Jim would want to know the whole story, not that he’d likely believe her or anything. The tiny points of light on the walls continued to shed an eerie early-dawn-like hue around, and far ahead lay another bend in the passage. A foul smell tinged the air and intensified the further she walked. She pulled her turtleneck over her mouth and nose, and held it with one hand. Maybe it was a dead animal, a dog or a deer that wandered in and couldn’t find its way out again. Smelled like a whole herd of deer. The tunnel finally straightened and another scene lay before her. Jess’s eyes flitted back and forth over the strange tableau which could have been a clip from a thousand war movies. Bodies lay in the middle of a tall grassy field, piled in a single mound, surrounded by other bodies. Each wore a uniform, or what was left of it. A few still held rifles. In front of the funeral pyre a soldier sat propped against those behind him. His eyes were wide and staring, and there was a fist-sized hole clean through his chest. What was once white flesh was now gray and spackled with blood. The splintered ends of two white ribs showed even at that distance. A river of dried brown blood cascaded onto his lap and over the tops of his legs. The body, that soldier, was looking right at Jess, and it was Jim, down to the bushy moustache. Jess froze for few seconds, unable to move or even think clearly. Then she turned and sped down the tunnel, across the expansive main cavern, and up to the small cave opening. She wriggled through the mouth once more, and brushed herself off. The dry heaves kicked in then and Jess’ throat burned when the bagel from an hour before refused to come up. She stood and stretched to her full 5’ 9” frame, and gasped in the frigid air, one, two, three full breaths. What she wouldn’t give for a paper bag. Jim. She had to get back to Jim. He was sitting on a log, sipping from a blue speckled cup, when she reached the top. Jess checked the time. It had to be longer than five minutes–more like an hour. She sat on the log next to Jim and took the cup of steaming coffee. She held her face close and let its warmth caress her. Maybe it had been a dream after all. They rappelled twice more, but Jess barely said a word. “Tired?” Jim asked, for a third time. Jess smiled and Jim took it as a yes. Jim made one more solo trip to the top of the cliff and loaded up the gear. In a few moments he was back and handed Jess her pack. They started off the way they had come in, and passed below the hollow Jess had explored. But she refused to say anything, and tried to shake the dream-shadows from her mind. The cry of a red tail hawk drew Jim’s attention up the hillside and toward the nearly hidden dark spot there. Jim cringed. Never mind; her tiredness was making her cranky, and soon it wouldn’t matter anyway. Jim pulled into Jess’s driveway, and said goodbye. He would miss her after he left for Quantico the following day—Quantico and the Marine Corps. Surely Jess would understand, and maybe even wait for him. They had nothing more than a solid friendship, yet if he stayed things might progress. Jim wasn’t ready for that. The rest of day, Jim would tie up loose ends. He turned his cell phone over to his baby brother who’d been begging for one since his fourteenth birthday. He said goodbye to his mother and brothers, then crossed town and stayed with his father until his plane left early the next morning. His dad told him stories of his two tours in Desert Storm one last time. And one last time Dad bragged about his illustrious military career. Jess put the matter of caves and dead soldiers behind her. Yes, she had somehow dreamed it after all, dozed while resting on the cold rock with her warm backside. She made a bank withdrawal the next day, picked up the package at the post office, and returned home. Her belt pack lay on the table, she extracted her trusty knife, and flipped it open. The blade shone, tiny sparks of light clinging to its edge. She rolled the knife handle back and forth in her hand. The cave. The light flecks. When she turned it over, Jess was flung back to the day before. A jungle scene spread across the canvas with the bluest of blue skies and greenest of green plants. A monkey in mid-swing between two trees, and the wings of a red, yellow, and green parrot spanned several branches. A deer drank from a nearby stream and a white fuzzy sloth lay high up on the crotch of a branch. Jess lay awake too long that night. When she finally slept, it was fitfully, and her dreams were of dead soldiers heaped on a battlefield far away from home, and one emaciated soldier gnawing on the beak of a parrot. 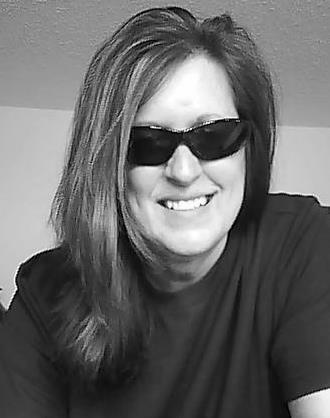 Maggie Whitefeather is a multi-published magazine author. She lives in Iowa with her husband, a couple of Jeeps, and chickens that lay green eggs. One of her favorite activities is teaching at writing conferences where she hopes her imitation of a Margaret Atwood wannabe deflects the Blind Assassins. She is very proud of her Cherokee heritage. “It’s remarkable, isn’t it?” Simon asked his wife with a smile. “Knowing when you’re going to die.” He wrapped his arms around her as they stared into the ever growing sunset. She shuddered. She was far less optimistic about her fate. “How can you be so calm? I can’t believe it! They left us behind! This isn’t happening!” Her voice squeaked with frustration and sorrow. He was bitter, but not for himself – for her. She did not feel what he felt. She did not see the beautiful light that had grown larger with each and every day since the others left. It was magnificent. But, instead of seeing the world unfold majestically around them, she mourned the loss of herself, forcing him to grieve for their end as well. What a pity, he thought. She doesn’t see eternity opening before her eyes. Simon said nothing. Instead, he chose to hold her as tight as he could, forming a shield of love around them both. At first, she hit him, pounding her fists into his chest like a fighter trying to end a bout with an unforgiving destiny. Still, he squeezed her tighter until her hands relaxed and wrapped around his waist. The tears flowed quicker, but not in anger. These were tears of anguish, depression, and fear. “Why us?” she asked through her sobs. They stood there watching the sun grow in the horizon, wrapped up in each other’s arm. The sun set largest on that day, never to set again. It was true Mrs. Stephenson was a woman who didn’t have a heart. She had a hole that ran through her chest to her back. Mrs. Dobson couldn’t stand looking at it. It looked so ghastly. The woman seemed deformed. She was like a walking painting. Mrs. Dobson thought, I could stick my hand right through that empty space. Looking at Mrs. Stephenson made her depressed. Mrs. Dobson had a lot of problems herself. One of them was that she was too interested in peoples’ personal lives. She styled herself a ‘matchmaker.’ She didn’t count the people who separated after she had introduced them. Those were practice. There were many people who didn’t take to Mrs. Dobson. They thought she was bossy. The woman next to Mrs. Dobson pleaded with her. The woman knew it was hopeless. She couldn’t stop Mrs. Dobson. Mrs. Dobson’s head was spinning at the moment. She was thinking of ways to make the hole disappear. Obviously the hole in her heart was symbolic. Mrs. Stephenson was missing out on life. Or she didn’t feel love anymore. Mrs. Stephenson was in her mid 30’s and had long brown curly hair. She was kind of plain. She wore a jean-blue dress. It was a church social. Mrs. Dobson was a heavy-set woman who wore too much makeup. She approached Mrs. Stephenson and said exactly what was on her mind. “You know you have a hole in your heart,” she said as she hid her face, embarrassed. “You are?” Mrs. Stephenson asked. Mrs. Stephenson had heard of Mrs. Dobson’s ways before. Somehow they had never run into each other. It was a big church. It had been a year since Mrs. Stephenson had gotten the hole in her heart. It happened a month after her husband died. She went to the mirror and there it was. A hole that went straight through her chest to her back. The doctors said it was a miracle that she didn’t die. Mrs. Stephenson agreed. She didn’t know what was keeping her alive. Ever since her husband’s death, her friends hadn’t been there much for her. She’d had back problems. It was hard just to make it through a work day. She had so much fatigue. Often when she would come home from work, she would just lay flat down on the couch and rest. She was desperate though. She was sick of the weird looks she got from strangers. She was sick of being tired. She wanted a reason to wake up in the morning. If this woman could possibly offer a cure, then Mrs. Stephenson thought Why not? What did she have to lose? So she agreed to Mrs. Dobson’s “I’m-going-to-help-you” approach. She didn’t know what she was signing herself up for. The next day Mrs. Stephenson found a man at her doorstep. He was a plumber. He was reasonably good looking. He seemed younger than her, though, by a couple of years. Filling her in on the information didn’t help. It reminded her of her husband who watched football but didn’t include her in it. This guy needed a girl who liked sports or who was used to such talk. She supposed, though, he was better than the next guy Mrs. Dobson chose—an arrogant businessman. The whole time, he talked about his business. He didn’t ask her once about herself. That, Mrs. Stephenson thought, is rude. She never thought about getting another man. She had a perfect man. He just died too soon. She was often asked about the hole in her heart, and she had to apologize for it. At least most were nice about it. Some people told her it was grotesque. Eventually, Mrs. Dobson began to realize that men weren’t the way to help Mrs. Stephenson, at least with the men around her. So she decided that what the girl needed were more church activities. She needed to get to know the women of their church more. Now, Mrs. Stephenson, at this time in her life, went every once in a while to an activity. She usually only went if it interested her. Mrs. Dobson insisted on her attending them all. There were activities on Wednesday nights plus on the occasional weekend. Mrs. Stephenson did like the bake-off. It was fun making cupcakes and then frosting them. But at all of the others, she felt weird. These women talked about their children most of the time. She didn’t have any children. She couldn’t relate. She liked activities that were more active. One day Mrs. Stephenson was driving around when she saw some dogs being sold on the side of the road. They were cute little dogs. She had to have one. A week later, a little heart could be seen inside her hole. It was the talk of the neighborhood. Mrs. Dobson scoffed about it. “A puppy? Come on!” she said, annoyed. Oliver Wilder kicked at a shiny round pebble. He didn’t know it would bounce off his new tennis shoes like that and fly across the sandy walkway down into the humid, shadowy ravine—a place he loved to go and hated to go all at the same time. It was better to go with A.J. and Mitch, because then they were a gang. But sometimes he still went down in there by himself. Sometimes even at night. The scent of honeysuckle wafted through the warm summertime air of Greenburg like sweet smoke. Oliver could hear the peep-peep of bats, but they didn’t scare him because they weren’t vampire bats, and even if they were, he always had his sharp stake with him in case one of them decided to transform into a vampire after a midnight snack. On the other side of the ravine was Ray Park. And after that, the neighborhood where the twins Georgia and Carolina lived. Their family was originally from some place called ‘the Deep South,’ they said, and that’s why they were named that. Georgia liked to be called ‘George’ because she loved some other place called England, and Carolina liked to be called ‘Bogie’ because she was in love with the ‘Golden Age of Hollywood’—whatever that meant. Oliver didn’t have time for girls and their silly talk and deadly cooties. He was too busy with the guys. They had to find new fishing holes and explore crumbly old castles and build tree-houses—No Girls Allowed! The kids at school sometimes asked Oliver if he was a Conservative or a Liberal. The first time it happened, when he got home he asked his dad what those words meant. Miles looked at his son, a deeper sadness in his eyes than Oliver had ever seen before. He nodded his head, but said nothing. “Sure. I get it.” Oliver slid his arm around his dad’s shoulders and gave a good squeeze. “Thanks. For the talk.” Then he was out the door in search of any vestiges, no matter how small, of nonhuman civilization on Planet Gliese. And upon Tuesday the priests came in, and the people, and they did worship Chu-bu and offered fat to him, saying, “O Chu-bu who made everything,” and then the priests sang, “There is also Sheemish”; and Chu-bu was put to shame and spake not for three days. It is not with the gods as it is with men. We are angry one with another and turn from our anger again, but the wrath of the gods is enduring. Chu-bu remembered and Sheemish did not forget. They spake as we do not speak, in silence yet heard of each other, nor were their thoughts as our thoughts. We should not judge them merely by human standards. All night long they spake and all night said these words only: “Dirty Chu-bu,” “Dirty Sheemish.” “Dirty Chu-bu,” “Dirty Sheemish,” all night long. Their wrath had not tired at dawn, and neither had wearied of his accusation. And gradually Chu-bu came to realize that he was nothing more than the equal of Sheemish. All gods are jealous, but this equality with the upstart Sheemish, a thing of painted wood a hundred years newer than Chu-bu, and this worship given to Sheemish in Chu-bu’s own temple, were particularly bitter. Chu-bu was jealous even for a god; and when Tuesday came again, the third day of Sheemish’s worship, Chu-bu could bear it no longer. He felt that his anger must be revealed at all costs, and he returned with all the vehemence of his will to achieving a little earthquake. The worshippers had just gone from his temple when Chu-bu settled his will to attain this miracle. Now and then his meditations were disturbed by that now familiar dictum, “Dirty Chu-bu,” but Chu-bu willed ferociously, not even stopping to say what he longed to say and had already said nine hundred times, and presently even these interruptions ceased.